The mornings seem to come quickly lately. I find myself feeling like I went to bed only moments before I wake up. The rest that a full night’s sleep is meant to prepare us for seems lacking. And since I am not a morning person, prayer and grace and coffee are my ammunition and armor…not necessarily in that order. And sometimes, especially when I am tired I load up on one rather than the other and it leaves me even more depleted as I start the day. How can our tank be empty if we keep filling it and filling it and filling it? My grandmother, in her frank and insightful way, would tell me I am bearing the weight of the world not meant for me to carry. She would be right, as usual. But those tanks we are filling… the ones we keep pouring time and busy and broken into… they are empty because we aren’t being filled with the good and the true and the beautiful and the lovely. To be honest, I evade confrontation as much as possible. And because I want to count those #gracemoments like the molecules of holy oxygen to be inhaled and exhaled purposefully, I find that I can easily let things simmer…unaddressed and untouched. And eventually that leads to less than graceful moments when the boiled pot runs over. I was going to write about walking in love, speaking a language we all yearn to hear and know. But the more I settled into that space where fingers hover and words build, I realized that maybe today you are feeling a little like I am and need the reminder God graciously poured over my heart as I opened up His Word to wait and receive. His Word is always the wisdom that always brings peace in every situation. Rejoice in the Lord always; and again I say Rejoice. Be careful for nothing; but in everything by prayer and supplication with thanksgiving let your requests be made known unto God. And the peace of God, which passes all understanding, shall keep your heart and minds through Christ Jesus. The 3rd verse of this chapter Paul wrote to the Philippians caused me to go back and read it a few times over. In his appeal, Paul is reminding us to exhort and help those who are toiling together. In the amplified version it uses the word, ‘cooperate’, to further reveal his prayer for this body of believers. Paul was warning against the burden that toiling can produce, especially toiling together with people. We tend to get tired and miss the blessing of walking with one another easily when we fail to be filled by His Way. 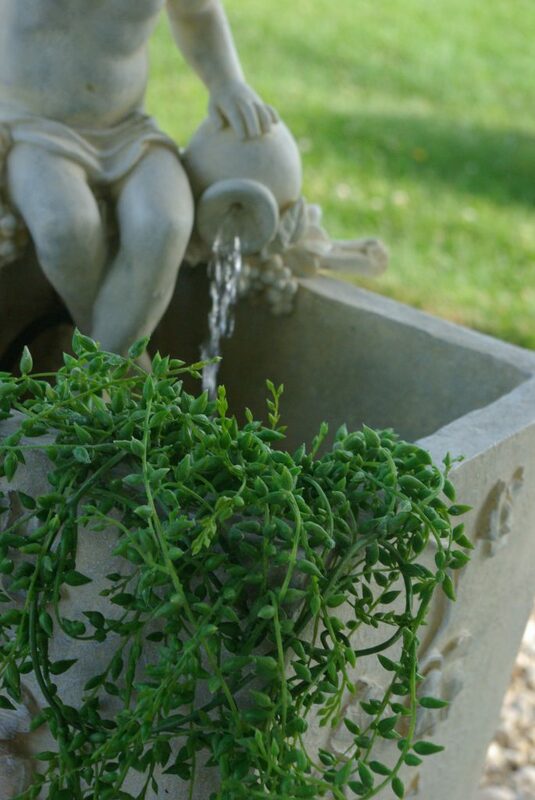 We forget to let true things, beautiful things, good things, praiseworthy things gather up like #gracemoments. Or at least, I know I can. As His Word poured over my heart, I took part in an exchange. 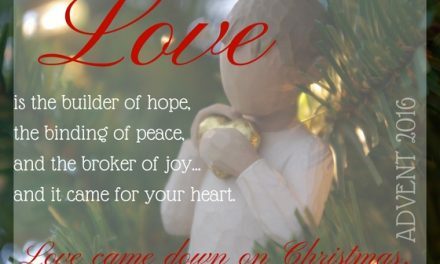 No longer can the weight of the world become my mantle, rather, it’s the grace that comes with His love and salvation… the act of cooperating with God leads us to peace. Praise and prayer lead us right into His presence and equip us to look for His work in our world instead of bear it as a burden. When we choose to rejoice, cooperating with the Holy Spirit in the midst of our every day moments, we are collecting grace like a commodity of hope. When truth, goodness, beauty, virtue, loveliness and honesty are the companions we keep, we lose the burdens that cover us in the journey and count the wonder of His presence in our midst. When we pour out the everything that has encroached upon the door of our hearts daily in prayer and supplication and thanksgiving, peace is the always the result. 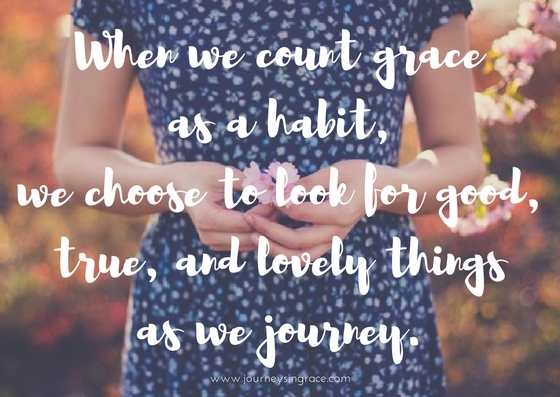 When we count grace as a habit, we look for the good, true and lovely in each of our journeys. My mom and grandmother taught me early the beauty of choosing and counting grace by living Philippians 4:8 in real life right before me. What if we did that? What if we wore His Word like a lens over our eyes and chose to look for the good things instead of flaws? Perhaps if we are so busy trying to find and remind people of the beauty we see in them, speak honestly in love and mercy, and pursue peace as a common thread in all things we’ll find that others see that also in us. And this common goal of gospel living, it really can be achieved cooperatively rather than comparatively. I want to cooperate with God more than I want to carry the unnecessary weights that leave me exhausted and empty. 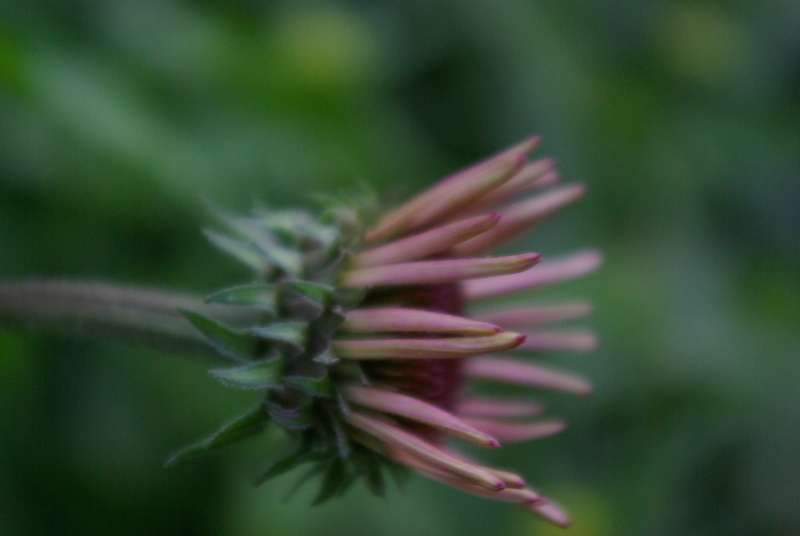 I want to see through the lens of truth, goodness, and beauty and speak with peace as my language, always. Because pursuing His Way, choosing to filter the world with His Word, and letting prayer, praise, and peace prompt our conversations will always result in collecting grace on the journey. As we move through this day, let us start with rejoicing and be strengthened in prayer. May His love help us to put on the lens of grace to filter our day. 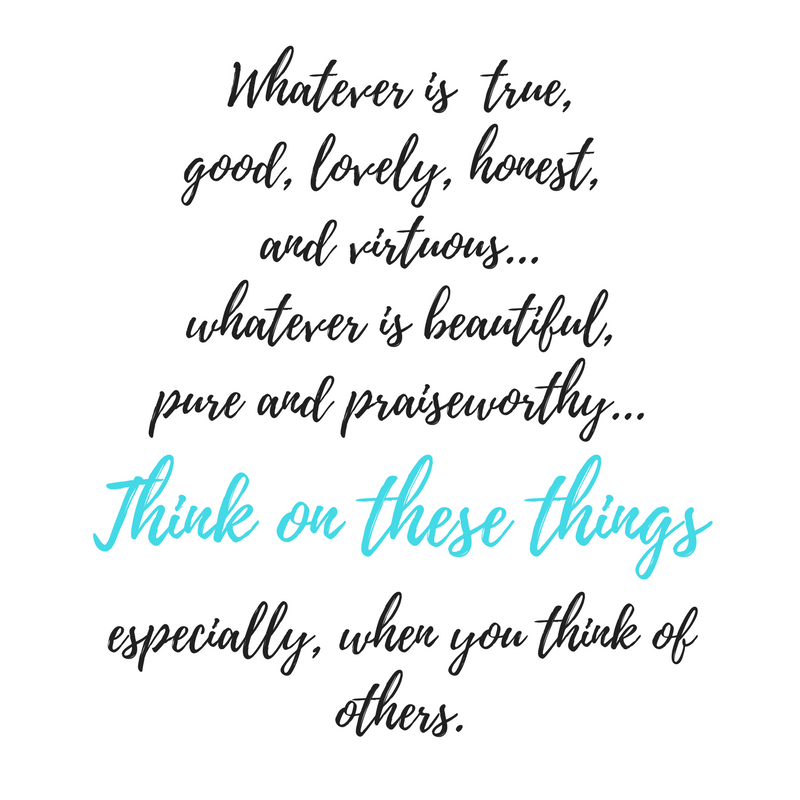 Let’s choose the good, true, beautiful, lovely, and virtuous things before us and fill up on His Word when we are emptied so that we can cooperate with God in our journey. Let peace rule our words and our thoughts, and His love fill us up so we are more than able to exhort others as we count each #gracemoment in our lives. IT’S YOUR TURN TO BE A GRACE COUNTER! 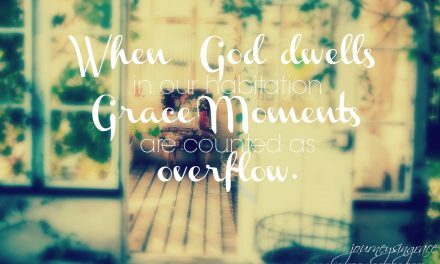 SHARE YOUR GRACE MOMENT IN THE COMMENTS BELOW AND THEN COUNT GRACE WITH A FRIEND WITH COMMENT ON A BLOG OR TWO. Take time to visit your neighbor next to you, and if you want visit a few more friends on the journey. We all need a little encouragement and affirmation as we travel together. 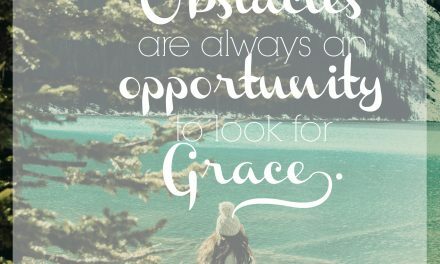 If you don’t have a blog, you can connect with me via my Journeys in Grace FB page by sharing a photo or a comment. Or you can join the party by sharing your images on Instagram with #Gracemoments hashtag. Each week I will try visit as many of your amazing posts as I can.This is a safe place to sit and dwell in grace together, friends. I can’t wait to pour a cup of friendship with you and take in the grace moments you have to share. Don’t forget to leave a comment below, I love to hear from you. There are so many names by which I'd love to be known ~ Christian, Wife, Momma, Homeschooler, Friend, Encourager. My heart is to follow after Psalm 37:4, seeking God with all my heart, and to embrace 1 Corinthians 10:31, whatever I do in thought word or deed... bringing glory to God in my life. As a wife and mom I love to take care of my family, usually that involves my kitchen and the many ways I can create awesome treats and meals. Teaching my children has become a fertile ground of continual hunger for new information drawing us to new and amazing place of wonder as we study His amazing creation. I beliive that as a homeschooler I can create an atmosphere where learning is a way of life, a process that all can grasp on their own unique levels. Following of Christ I have found my true passion, which is prayer and encouragement. I love the opportunity to walk alongside the amazing people that the Lord weaves into my life so beautifully that when we look back we can view the tapestry of His love stamped upon our lives. I am blessed not because I have any special gifts but because I serve an amazing and awesome God who desires to be a blessing and endows us with gifts and abilities which allow us to love, just like He does. Dawn, I love this emphasis on the beauty of choosing — deciding what we will dwell on, being intentional about the thoughts that shape our days. I love this approach to drop the weight of the world, and instead pick up the grace that comes with God’s love. When we spread that, it rubs off on us, too. Thanks, Dawn. Dawn- you always have such wisdom and advice here:) Thank you for the reminder to look for the good and blessings every day! Join the mailing list to receive the latest updates from the blog.